Tragic news today from the Olympus Rally, where 31-year-old Matthew Marker of Elk Rapids, MI was killed in an accident during the sixth stage of the rally's first day. Jalopnik confidant Michael Power reports from the event. Additional reporting by The Seattle Times. The accident occurred on the sixth stage of the first day of the event, when Marker lost control on a curve, slid down a 40-foot embankment and struck a tree. 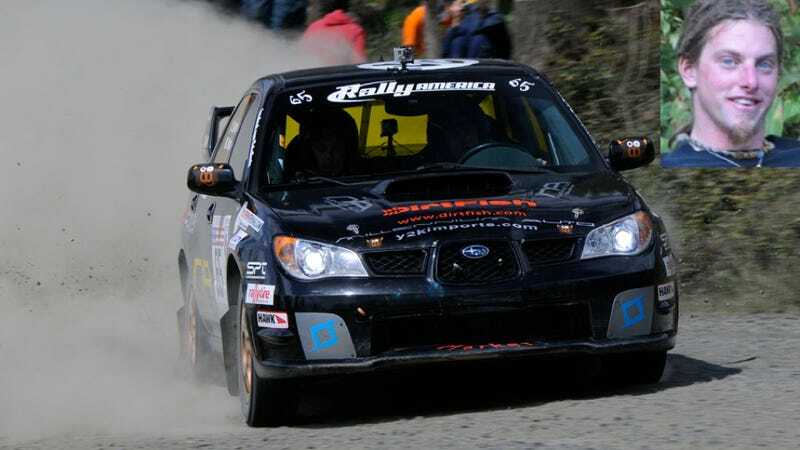 Rally America Managing Director JB Niday and event officials cancelled the second day of the Rally America National Championship event after the tragedy but decided to continue the regional event. Rally America says that this is not an issue of safety measures failing. It was a tragic racing accident. "It is a very difficult decision to continue after something like this happens but it is better to move forward as a therapy for everyone," Niday said. Niday described Marker, 31, as "a generous, lovable screwball that wouldn't think twice about offering parts to other drivers. He loved the sport and was a unique character from the first day he showed up with a car that wouldn't pass spec at the Sno*Drift Rally four years ago." Jake Blattner, co-driver for rally competitor Dillon Van Way, remembers Marker as "a very passionate, energetic hippy gearhead," who "used to turn up with glowing neon lights under his car on the night stages, which the fans loved." "It's a dangerous sport but that's what sets it apart," Blattner said. "It's you against the wild open road and the clock." Rally America has not seen a fatality since Mark Lovell and co-driver Roger Freeman were killed during the Oregon Trail Rally in 2003.